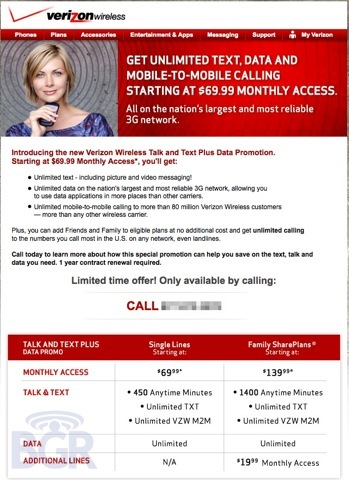 In an effort to compete with Sprint’s low priced unlimited plans, Verizon has begun testing a new unlimited plan. For $69.99, customers will be entitled to 450 minutes, unlimited text, unlimited mobile to mobile, unlimited data, and Friends and Family with eligible plans. The company is also offering a Family SharePlan that starts at $139.99. This price includes two lines with 1400 shared anytime minutes, unlimited texts, mobile to mobile, and unlimited data. To add on additional lines (up to 5), it will cost an additional $19.99 a month. This flyer was sent out in an email to select customers. All the plans listed require a 1 year contract renewal. To sign up for this plan you should call 877-873-3278.